We love it when Kate Middleton wears trendy, yet affordable, clothes that us non-royals can wear as well! We spotted the pregnant Duchess wearing a Topshop polka dot dress paired with a black blazer, and we have rounded up similar items so you can copy her polished look. The Duchess of Cambridge has dressed her baby bump in high-end fashions, as well as trendy looks that are surprisingly budget friendly! Due in July, Kate has thus far stuck to "non-maternity" flowing dresses and tailored jackets to fit her changing body. The royal mum-to-be has kept her look polished and pulled together, with printed dresses such as the MaxMara printed jersey wrap dress and her favorite suede pumps. In fact, her maternity style is in sync with her pre-pregnancy looks. "She's in a perfect position to just continue with her exact same dressing philosophy. She wears things that are fitted, and that should also continue during her pregnancy. Her clothes are tailored beautifully and will show her expanding baby bump in a tasteful way," maternity designer Liz Lange told USA Today. "She wears a lot of solid-color dresses, and that will work perfectly for her during her pregnancy. She'll continue to wear beautiful, rich colors. Dresses are the easiest way to look elegant while you're pregnant, and Kate wears dresses that can be taken from non-maternity to maternity," Lange said. Polka dots are the hottest print this season, so it is no wonder that the trendy Kate chose this polka-dotted dress to show off her baby bump. 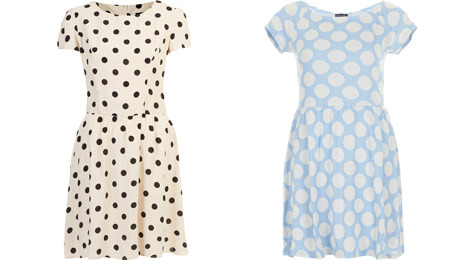 Kate is wearing the Topshop Polka Dot Dress ($76). As soon as the Duchess was spotted wearing this spotted dress, it sold out within the hour! If you can't wait for it to be back in stock, check out Topshop's Spot Bardot Tunic ($64) which features pale blue dots. This ASOS Maternity Spot Skater Dress ($42) features the same fun black and white spotted print as Kate's dress, but includes a pop of color with a green belt. 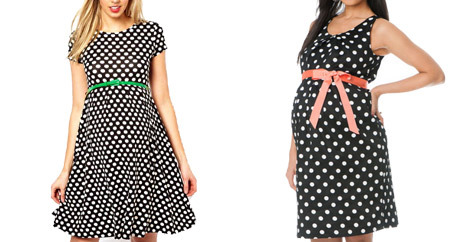 For a sleeveless version, this black and white polka dot dress from Destination Maternity ($30) features a pink belt. Kate gives her look a polished finish with a black wool Ralph Lauren Black blazer, which is unfortunately no longer available. Copy her look with the Waverly Collarless Blazer in black ($69) from Piperlime. She paired her look with black suede Episode Angel pumps, similar to the Flax by Nine West black suede heels ($60).